Science Sounds The Alarm About Your Brain and Gluten! I think this is the area where we are going to see the most breakthroughs in medicine as it relates to celiac disease, gluten and our brains. I experience severe neurological symptoms when I accidentally ingest gluten as do many customers and one of my close friends. Recently, after a severe glutening and neurological complications as part of her response, my friend saw her gastro; who sent her to a neurologist. The neurologist confirmed the complications from gluten exposure after her ran tests and ruled out MS. So, it is great to see this being acknowledged by neurologists. Allergic Living recently did an article; about the scientific proof and the devastating effects that gluten can have on your Brain. Dr. Marios Hadjivassiliou was the first to study this! He said that the patients had “significantly less” brain density. The study showed that there were changes to the cerebellum (balance center) and to the thalamus which conveys sensory and motor signals to the cerebral cortex, and to areas of the brain associated with depression. For some it is just the inability to think clearly or being diagnosed with ADHD or Autism, when actually it could be Celiac Disease. 10-30% of those with Celiac Disease have some form of neurological complications. It can be headaches, the inability to walk in a straight line, fumbled speech, walking into things, being off balance. The doctor even advocates for questions about headache and loss of balance to be asked when they go over a celiac symptom checklist! Those with bowel complaints are easy to diagnose, but many don’t have bowel complaints because their only symptoms are neurological! Unfortunately for those without bowel issues; by the time they get to their neurologist it is too late because the nervous system does not regenerate like the intestines do. When this is the case, the gluten free diet will only halt the damage in it’s tracks but not reverse the damage. This motor control condition is called Gluten Ataxia; where grey matter accumulates on the brain and can shrink areas of the brain! The gluten free diet can halt additional damage, but it does not mean they will be able to walk again. While most mild cases won’t show up on brain scans, Hadjivassiliou’s research shows that repeated incidents of getting “glutened” or “cheating” on the diet can lead to more serious, long-term brain effects. Gluten actually causes increased intestinal permeability by inducing a compound called zonulin to be released. Zonulin causes tight junctions to not be so tight…thus increased intestinal permeability. The large gluten molecule is able to molecularly interact with our body and cause our body to increase zonulin production…zonulin then causes increased permeability…and then this large gluten molecule is able to get into our body. The gluten molecule is too large to normally enter our body therefore when it does gain access to our body through our small intestine, our immune system perceives it as a threat and for some people it starts the cascade of a chronic disease. So how does this all come together???? Thanks to Dr Alessio Fasano at the Center for Celiac Research, we know that gluten causes increased intestinal permiability (little holes in the walls of the intestine) which causes a compound “Zonulin” to be released which allows the gluten molecule to get into our bloodstream thru the little holes in our intestines. Once it gets there our immune system sees it as a “threat” and for some it causes a whole list of chronic diseases. Also, zonulin causes cellular reactions throughout the body, not just within the gut. For some people this will never happen, for others it will! Check out my blog under “brain” for past articles from newsletters where I wrote about this as well! 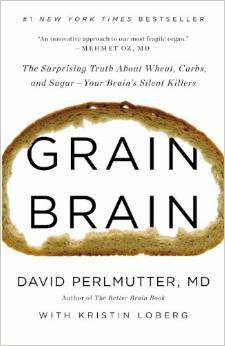 Many customers, while dining in my cafe, have asked me what I thought of Grain Brain, written by renowned neurologist, David Perlmutter, MD. First, I will say that the book is excellent and a must read for everyone, especially if you or your family are touched by Celiac, gluten sensitivity, autism, dementia, alzheimer’s, stroke or heart disease! Dr Perlmutter goes into great detail about the care and feeding of your brain. Showing, through research, studies and clinical experience exactly how healthy carbohydrates; such as whole grains and sugar can cause dementia, ADHD, epilepsy, anxiety, headaches, depression and more. I made some some notes while reading the book that you might find of interest. First and foremost, Dr Perlmutter believes that Gluten Sensitivity is the real issue at hand and that Celiac Disease is an extreme manifestation of Gluten Sensitivity. -Celiac Disease is an extreme manifestation of gluten sensitivity; the most severe reaction to gluten. -1 in 30 people have Celiac Disease as estimated by Dr Perlmutter, although experts say 1 in 200 or 1 in 131; many are not diagnosed. -1 in 4 people are vulnerable to Celiac Disease due to genetics alone and those of northern European descent are more susceptible. -A person’s genes determine gluten sensitivity or severity, meaning there is a very wide spectrum to it. -Gluten does not just harm the gut, once the genes are triggered, sensitivity to gluten is lifelong condition that can affect the skin, mucous membranes and the mouth. Gluten reactions can involve any organ in the body including the brain, even if the gut is fine. -The brain is at great risk if a person is gluten sensitive. -Food Sensitivities are usually a response from the immune system. The presence of gluten basically disables the body’s immune system and it can’t fully support the body’s natural defenses. -About 45% of people with ASD (autism spectrum disorders) have gastrointestinal problems. There is an increased prevalence of celiac in pediatric cases of autism, compared to the general population. -People with Celiac Disease may be at increased risk for developmental delays, tic disorders, learning disorders and ADHD. -Depression and anxiety are often severe in those with gluten sensitivity. -He dispels the myth that all fat is bad for you. Low cholesterol can affect mood and put your brain at risk. Your brain needs fat and is made of fat. -Inflammation is the cornerstone to brain disease. He goes into great detail about dementia and alzheimer’s disease and the role gluten plays along with sugar, statin drugs, strokes, diabetes and so much more. Much time is devoted to talking about how all carbohydrates; grains and sugar are causing us problems (inflammation) and has lots of studies and clinical experience referenced in the book. There is also great information in the book about vitamin deficiencies, leaky gut and more. This is from our Feb 2012 Newsletter. If you think you have gluten ataxia or balance or coordination issues, speech impairment or any brain involvement when ingesting gluten, this is great information for you to have and it may be worth taking it to your doctor if they don’t seem to be listening to you. This has case studies from Gastroenterologists and Neurologists. Amazing MRI’s of the brain showing before and after of a person with rapid onset of Ataxia over a period of 15 months.